'BELLS COTTAGE', a traditional Kerry farmhouse, very cosy and comfortable, a bright and friendly holiday home on 6 acres of private grounds with lovely secluded gardens around the house, and within walking distance of the lake there are a couple of beautiful country houses/restaurants on the lake shore. Caragh Lake at the foot of the mighty Macgillicuddy Reeks and only 10 minutes from Rossbeigh Beach part of the Wild Atlantic Way , is one of the most beautiful lakes in County Kerry, peaceful and unspoilt, with Mediterranean growth due to the very mild climate all year round. The farmhouse has been lovingly restored maintaining its original charm and character. With two open fireplaces and central heating, tasteful furniture, beautiful original paintings, it provides a homely retreat with the highest level of comfort. Particular attention has been paid to low allergen materials.The kitchen has built-in units in old pine, an old dresser, table and chairs and a comfortable armchair beside the fireplace. The bedrooms are upstairs, there is one en-suite double with 2 push-together singles, a further double with 2 singles. The beds are of excellent quality. Additional shower room off the landing..
Caragh Lake is an ideal base for a golfing holiday. With more than 10 spectacular and challenging 18 hole courses on the doorstep, it is truly a golfer's paradise. Mahony's Point, Par 72 and Kileen, Par 72, at Killarney (Tel +353 - 64 - 6631034) are a 20 minute drive away. Tralee (+353 - 66 - 7136379), Par 71, designed by Arnold Palmer, 3/4 hour. 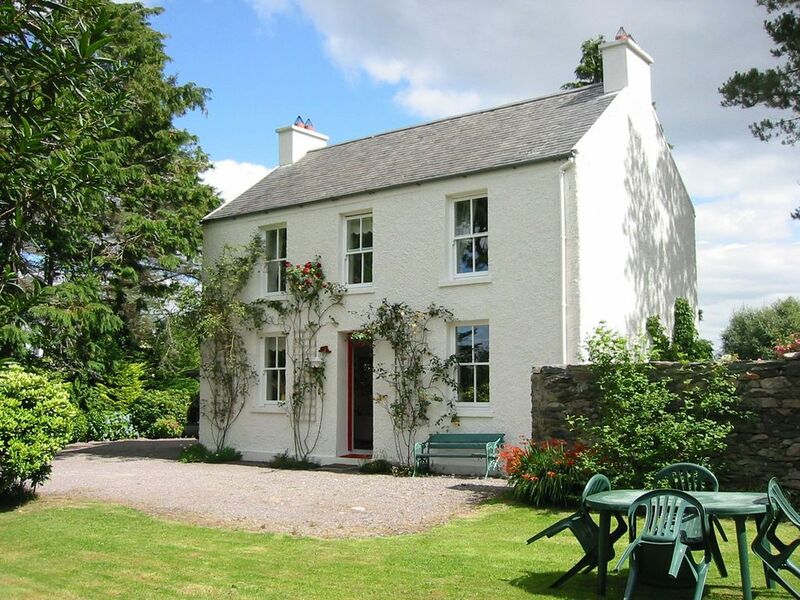 Beaufort (Tel +353 - 64 - 6644440) Par 71 about 15 minutes from Caragh Lake. The character of the house, beautifully and tastefully renovated in the old style, lovely paintings, old furniture. Bright and friendly. Well equipped, good beds, allergy friendly, and now also WiFi for our guests to keep in touch. Both bathrooms have windows with beautiful view into the garden. We would highly recommend this cottage - it is a lovely, characterful place set on beautiful grounds in a great location, close to the ring of Kerry. It is warm, cosy and comfortable too. Thanks for the nice review. It was a great pleasure to have you as guests and I can’t stress enough how spotless you left the cottage. Bell's cottage is a beautiful and charming hideaway with friendly hosts Evi and Rolf who visited several times to ensure all is well. During our stay, we experienced glorious sunshine and gale force winds on the wild Atlantic way. The cottage is perfectly located to explore the Ring of Kerry and the Dingle peninsula. We also loved the wildlife in the gardens. Highly recommended. Thanks a lot for your positive review. We are glad you enjoyed your stay in Bells Cottage and our beloved area and this despite storm Callum visiting you. Thank you also for leaving Bells Cottage so spotless. A comfortable cottage in a beautiful setting. The home is cozy and the grounds spacious and calming. We enjoyed our 8 night stay. Bells Cottage is the perfect location to explore Killarney, Dingle Peninsula and of course the Ring of Kerry. It made a great base for us to come home to after our daily excursions. Killorglin has convenient shopping and dining and is a quick five-minute drive. Jack's by the beach was an excellent place for some seafood chowder and a pint. Thanks a lot for your nice review and also for calling Bells Cottage "a great base to come home to". We are trying our best to make our guests feel at home and are glad that you seem to have felt it. We love this place. The cottage is beautiful, set in a very tranquil location with plenty of outdoor space to relax in. The kitchen is well-equipped, allowing us to make dinner and enjoy it even more, and the rest is very nicely furnished. Evi and Rolf went far, far beyond the call of duty to help us with travel arrangements during the week. Local highlights of the week for us included renting bikes and riding to Rossbeigh Strand (and lunch at the Towers), riding to Caragh Lake for a picnic lunch (where we had the beach to ourselves on a beautiful day), and riding into Killorglin a couple of times (a 15-minute bike ride). Further afield, we spent a day driving past Dingle to do the Great Blasket Island tour (well worth it), and down to Kenmare and around part of the Ring of Kerry on another day. The cottage is a great base for exploring the region, set in beautiful scenery. We will definitely return sometime...hopefully soon. Thanks a lot for the lovely review, it is very much appreciated. It was a great pleasure to have you both as guests and it makes us happy to hear that you enjoyed your stay. Thank you also for leaving the place so spotless. We would certainly love to welcome you again some time. The cottage, flowers & entire property were beautiful. Very relaxing atmosphere. There are 2 towns a short drive away. The Ring is at the end of the cottage road. Based on our experience and the experiences noted in the guest book, Evi Is a great host. Our family highly recommends staying at the cottage. The Caragh Lake area, being part of Reeks District, https://reeksdistrict.com/, an exceptionally beautiful part of County Kerry, its landscapes are among the most scenic and dramatic in the country, it is part of the Killarney National Park, Macgillicuddy's Reeks and Caragh River Catchment area which has been designated Special Area of Conservation. A magnificent location to wind down and relax and in close proximity to all amenities, Killorglin and Killarney in easy reach, sandy beaches, golfing, fishing, walking and lots more close by. > Linen and towels are provided free of charge > Electricity, heating and hot water are included in the rates > WiFi is free also Saturday changeovers are preferable. We're flexible in off season. If you need to cancel we will happily refund transacted payments as long as we find a new guest for the same period. However the minimum amount retained is the deposit.